In an exclusive interview at Boeing’s Chicago headquarters, Chairman and CEO Dennis Muilenburg talked of heady growth plans, a company transformation around the next all-new jet, his push to acquire Embraer, his wooing of President Trump and the future of the Puget Sound region. CHICAGO — In his corner office high amid Chicago’s office towers, Boeing Chairman and Chief Executive Dennis Muilenburg has some words of reassurance for the Puget Sound region. “It’s still my Boeing home,” he said of the place where he spent the first 15 years of his Boeing career. Personally, as an ardent cyclist, he said that on trips to Boeing’s jet factories he takes every chance he gets to ride around the Pacific Northwest’s more challenging landscape in preference to Chicago’s flatlands. While insisting that Boeing has a solid commitment and investment here, he made clear that much remains up in the air regarding the most critical decision for its future — where and how Boeing will build its next all-new jet. And yet he also spoke of the edge Washington state has in the competition to build at least one important piece of that next plane. In an exclusive interview, Muilenburg ranged broadly, explaining why he’s chasing an acquisition of Brazilian jet maker Embraer and why he’ll continue to work closely with President Donald Trump. Boeing is riding high — churning out record numbers of airplanes, leading the Dow Jones industrials with a share price that’s more than doubled in the past year, and anticipating a tax windfall worth billions of dollars from Trump’s corporate tax reduction. Two-and-a-half years into his tenure as CEO, Muilenburg, 54, is on top of his world and ready to make aggressive business moves. 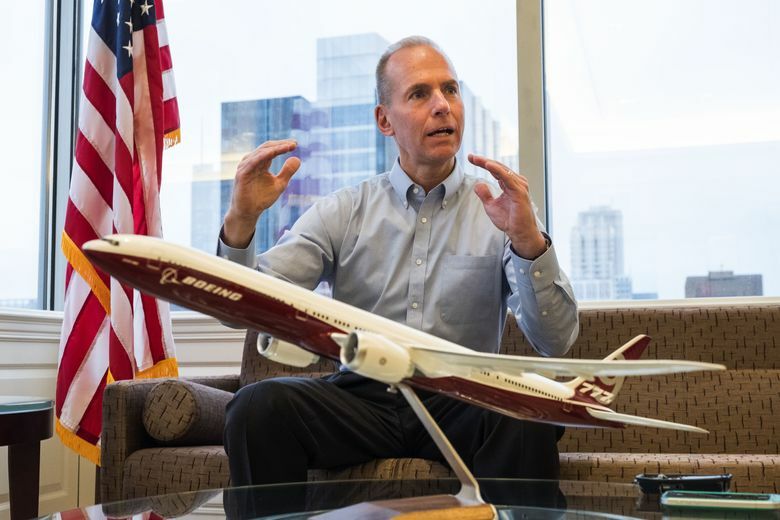 Although historically the troughs of Boeing busts cratered employment in the Seattle area,Muilenburg believes an expanding worldwide market for jets means the days of mass layoffs are over. As the global middle class expands, the annual growth of air passenger traffic has recently accelerated, from a historic trend of 5 percent to above 7 percent last year. “For the first time in our history, we have the chance to change Boeing from a highly cyclical business to a long-term, sustained-growth business,” he said. The direction in which he takes Boeing’s anticipated growth over the next few years will have a profound impact on the industrial future of the Pacific Northwest. 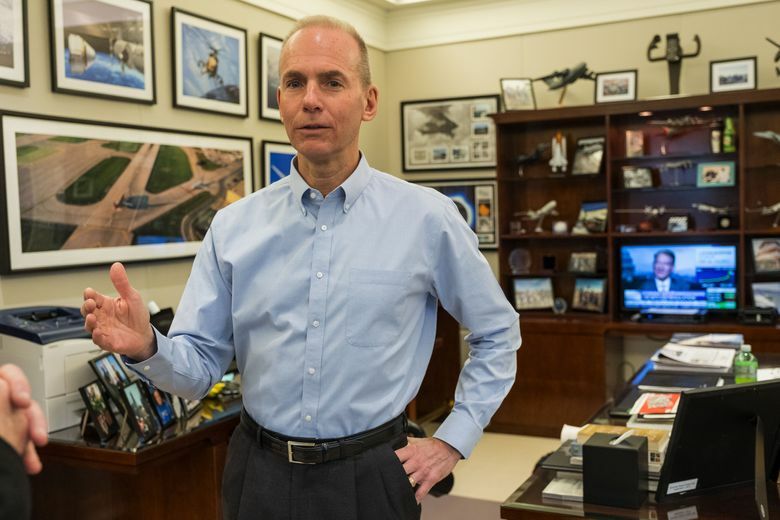 Muilenburg’s office is lined with bookcases full of Boeing airplane models, photos and memorabilia from his 32 years at the company. In one recent photo at the Kennedy Space Center in Cape Canaveral, Florida, he sports one of the stylish, deep-blue spacesuits Boeing designed for the next generation of space travel. Beside him, similarly clad, is his 13-year-old daughter, whom he’s subtly encouraging to pursue a STEM education. He showed off another photo of himself with a large group of Seattle-area employees, all in cycling gear and about to head out on a ride. Muilenburg started out as an engineer in Seattle. When he succeeded Jim McNerney as CEO in 2015, management quickly improved relations with Boeing’s white-collar union, hammering out a new six-year contract in secret negotiations with the Society of Professional Engineering Employees in Aerospace (SPEEA). Boeing’s Puget Sound-area work force has shrunk by more than 21,000 jobs since the last peak in fall 2012. But Muilenburg said the decline should stop in 2018, something local Boeing managers have also told Goforth. As it ramps up production, Boeing is unlikely to cut more machinists. And with the launch of a new airplane ahead by 2019, the company could even start staffing up again on engineers late this year. But he also reiterated the now-standard Boeing caution. 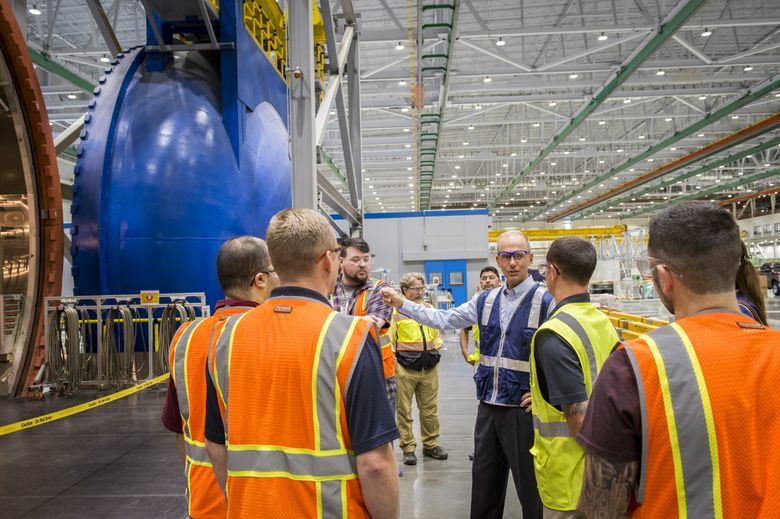 Boeing last year moved hundreds of jobs in its corporate back-office services unit from Washington state to Mesa, Arizona, simply because that’s “a good, affordable, competitive cost-structure site,” he said. Central to the long-term job outlook is whether this region will build Boeing’s next all-new jet, referred to informally as the 797. That could be either the so-called New Midmarket Airplane (NMA) that’s being studied for possible launch as early as this year, or a New Small Airplane (NSA) replacement for the 737. Whichever it is, it’s a key project that will transform the company. 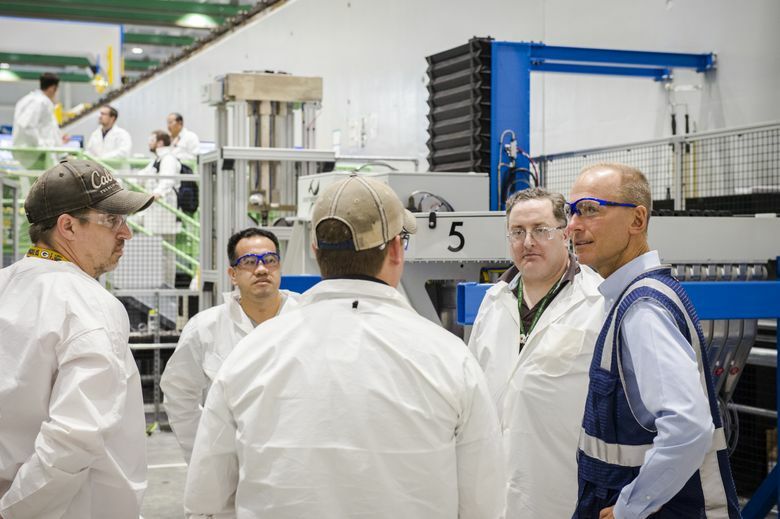 Muilenburg said his commercial airplane team will introduce an innovative, highly automated manufacturing system and also a new development process that builds in opportunities for Boeing to sell follow-on services throughout the service life of the airplane. What factors will determine where the jet will be built? And what can Washington state do to win? All these factors are being considered right now, he said, as part of the business case Boeing is building for the NMA. One plus for the Seattle region, he said, is that Boeing is now actively seeking talent outside the traditional aerospace pool. As Boeing moves into new high-tech areas such as autonomous vehicles, artificial intelligence and additive manufacturing, Muilenburg sees it competing not just with Airbus but with companies like Amazon and Microsoft that have attracted hordes of digital talent and innovative thinkers to Seattle. And Muilenburg indicated that this region has a key infrastructure advantage when it comes to building the 797’s wing. The boldest strategic move Boeing is contemplating right now is the potential multibillion-dollar acquisition of Brazilian planemaker Embraer. Embraer makes 70- to 130-seat regional jets, one size down from Boeing’s 737 family, as well as corporate jets and various military airplanes. Negotiations are ongoing as Boeing tries to allay the concerns of the Brazilian government about protecting jobs and military capabilities in Brazil. The talks became public in December following Airbus’ shock move to acquire control of the CSeries jet program from Bombardier of Canada. He confirmed The Seattle Times’ account of Boeing’s longtime interest in Embraer, stretching back to 1999, and the close partnership the two companies have enjoyed in recent years. He said Boeing’s interest in buying Embraer includes the potential to combine the engineering and manufacturing talent of the two companies. Also attractive, he said, are the complementary lineups of aircraft. He envisages selling packages of regional and mainline jets to carriers — such as Alaska Airlines — that have combined fleets of Embraer Ejets and Boeing 737s, as well as selling aftermarket services to such airlines across both aircraft sectors. If it can buy Embraer, Muilenburg said, Boeing will be able to go into the global marketplace with an expanded offering across regional, single-aisle and twin-aisle jets. If the acquisition is approved, Boeing won’t be short of money to close the deal. In addition to the $10 billion in loose cash it had in its coffers when it last reported earnings, it’s about to reap hundreds of millions more each year in a windfall from the big corporate tax reduction in the Trump tax bill. The legislation is expected to cut Boeing’s yearly tax bill by about 10 percent, boosting its bottom-line profit by 5 to 7 percent, or more than $400 million per year. “It’s an impact that’s measured in billions of dollars spread over multiple years,” Muilenburg said. Boeing has locked in jet orders at fixed prices for the next eight years, so this extra money is pure profit. Since Airbus won’t have that financial windfall, Boeing will also be able to use part of it to lower prices in future sales campaigns. He added that ultimately the tax cuts will help fund Boeing’s future airplanes. “That’s going to create jobs in the U.S., engineering and manufacturing jobs in particular,” he said. After a rocky start with President Trump, who criticized the high price of the Air Force One jets ordered from Boeing, Muilenburg worked to develop a close relationship with the president. He met with Trump several times and ironed out the Air Force One issue. He invited the president to North Charleston, South Carolina, for the first rollout of the 787-10, which Trump turned into a political rally. Muilenburg served on the president’s Manufacturing Council and chose not to join other CEOs in resigning from it after Trump’s highly criticized remarks last August about violence being instigated by “many sides” at a white-supremacist rally in Charlottesville, Virginia. Muilenburg defended his courting ofTrump. He said Trump has given business “a seat at the table,” and Boeing has duly played a role in such areas as pushing the corporate tax cut. “We are going to continue to stay engaged,” Muilenburg said. “But we want to have … access to the world’s best talent,” he added. Muilenburg has a daunting “must-do” list if Boeing is to continue its soaring trajectory. He has to launch the 797 and make sure it’s neither a sales dud like the Airbus A380 nor a money pit like the 787 Dreamliner. He has to get the new 777X automated production system in Everett operating smoothly, and successfully deliver the airplane, the next generation of the company’s highly profitable widebody jet. He has to boost 787 production in Everett and North Charleston to 14 jets per month. And he has to ramp up his 737 assembly lines in Renton to an amazing 57 jets per month by next year, making sure the supply chain doesn’t collapse from the strain. If he can do all that, he’ll reap enormous benefits from the insatiable demand for airplanes worldwide. Boeing estimates that more than 80 percent of the world’s population has never taken even a single flight. It calculates that in Asia last year, about 100 million people flew for the first time in their lives.